For years, the health benefits of the Mediterranean diet have been widely documented and admired. It seems that our cousins in countries like Italy, Spain and France enjoy a much healthier diet than many other regions of the world. The food that typifies the Mediterranean menu is not necessarily lower in calories but the eating patterns generally mean that typical calorie counts are considerably lower. A lot of the food eaten tends to be richer, tastier and more satisfying. Processed food is off the menu, everything is cooked and prepared using fresh, natural ingredients treated with respect and cooked in a simple way. The net result is a diet that contains fewer calories than other diets and more health-giving vitamins, minerals and fibre. Like the food, the Mediterranean diet is essentially very simple. It’s a diet that rejects strict calorie counts and weighing scales, depending on the basic guidelines of how food should be chosen and prepared. very little meat is eaten. The most common meat in the diet is chicken which is lower in calories and cholesterol. a staple food is fish. The Mediterranean diet is rich with oily fish in particular. Choose mackerel, fresh tuna and sardines in your meals. Oily fish has the added advantage that the natural oils mean you won’t need to add extra fat during the cooking process. Mediterranean diets are packed with fresh fruit and vegetables which are served and prepared naturally or simply. There is a very big emphasis on the use of tomatoes, which make excellent low calorie bases for sauces, soups and casseroles. snacking the Mediterranean way shuns crisps, biscuits and cakes depending instead on tasty treats like olives and nuts. Nuts are relatively high in fat but the fat is much healthier than the saturated fat in most snack foods and only a few nuts are needed to bridge the gap between meals. dairy products are only eaten in moderation and their preparation is minimal so that the natural flavours can be appreciated. alcohol is enjoyed with meals and focuses on wine rather than calorie laden liqueurs. This delicious Italian appetizer lends itself really well to low calorie eating. Start by cutting ciabatta bread into thin slices and rub the cut surfaces with a fat garlic clove. Lightly toast the bread until golden. Prepare the topping while the bread is toasting. A traditional topping is finely chopped tomatoes, mixed with chopped red onion and a little shredded basil. Pile the topping onto the bread rounds and serve immediately. For an extra treat, finish the crostinis with a small sliver of goat’s cheese and grill until golden. Goat’s cheese is a really good choice. It’s much lower in fat and cholesterol than other types of cheese. 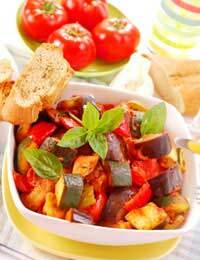 Ratatouille is a traditional French dish of vegetables cooked in a rich tomato sauce. Cooked with very little fat and lots of tasty fresh vegetables it’s the perfect example of good Mediterranean eating. It can be prepared with the minimum of oil. It’s delicious as an accompaniment to fish and chicken or it’s versatile enough to work as a complete meal. Choose your favourite vegetables for your ratatouille. The traditional choices are onion, garlic, tomato, aubergines and courgettes. Start your ratatouille by sweating the chopped onion with garlic. Add the vegetables gradually and finish with chopped, skinned tomatoes. If you wish, use tinned tomatoes or passata instead. Season the vegetable stew lightly and add chopped herbs such as thyme or oregano. Simmer gently until you have a rich, unctuous vegetable sauce. Serve as a side dish, tossed through pasta or with rice. The beauty of the Mediterranean diet is its simplicity and ease. By following a few simple principles you will find that your calorie counts will naturally fall and you’ll enjoy a varied, tasty and healthy diet.